Epact: Quadrant unsigned, 15th century ? 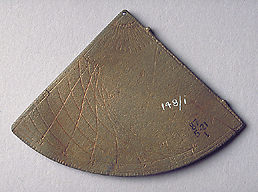 This small quadrant is engraved on one side with hour lines for Italian hours. On the other side is a table of the sun's maximum altitude according to the time of the year, corresponding to latitude 45?. The initials of the names of the months are however unusual, with 'Z' for January and June, and all the other months as in Italian. Since in the accent of the Venice and Bergamo area the letter 'g' followed by a vowel is pronounced 'z', the instrument is likely to have been made in that area. The script of the numbers is also not consistent: the number five is Gothic, but all the other digits are engraved in a later script.